And much more Caring for Your School-Age Child is an essential childcare resource for all parents who want to provide the very best care for their children--and the one guide pediatricians routinely recommend and parents can safely trust. You've outgrown the baby books--but your school-age child needs you more than ever. No longer are the middle years of childhood considered a time of relative calm and smooth development. During the years from five to twelve, children must master the skills and habits that determine their future health and well-being--and parents have a crucial role to play. 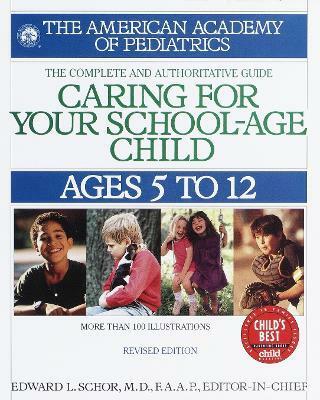 The American Academy of Pediatrics, the organization that represents the nation's finest pediatricians and the most advanced research and practice in the field of child health from infancy to young adulthood, presents this fully revised and updated guide for parents who want to help their children thrive during these exciting and challenging years. Caring for Your School-Age Child is an essential childcare resource for all parents who want to provide the very best care for their children--and the one guide pediatricians routinely recommend and parents can safely trust. Edward L. Schor is the editor of the book Caring for Your School-Age Child and has chaired both the Committee on Early Childhood, Adoption, and Dependent Care and the national Task Force on the Family for the American Academy of Pediatrics. He is also the senior vice president for programs and partnerships at the Lucile Packard Foundation for Children's Health.